Book author and self-help expert Shannon L. Alder once said "We all live our lives in shades of gray." This is interesting when you consider our customers with various shades of gray in their hair are losing status as the most important demographic, since millennials all of the sudden outnumber Baby Boomers. Millennials are loosely defined as those Americans between ages 18-34 (although some demographic experts move that number up to 40 years of age), number about 75.3mm. That is just ahead of Boomers, who number 74.0mm this year according to Pew Research. There's more to the growing importance of this group, however. Data from Javelin reports that by 2015, total millennial income will exceed that of Baby Boomers. Further, by 2020 millennial income is projected to exceed that of both Baby Boomers and Generation X. By 2025, millennial income is expected to account for 46% of the nation's income. For community banks, figuring out exactly what millennials want from financial institutions has been no easy task. The demographic is a contradiction in much of its behavior and this carries through to their financial behavior. There's an industry-wide presumption that younger customers care the most about new age services like mobile and alternative payments, and could care less about staid services like bank branches and checking account features. That's not so, at least not yet. 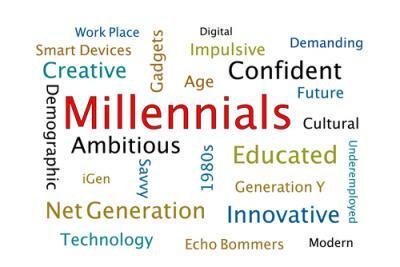 Millennials do want mobile technologies, there's no doubt about that. But they also very much want access to "old school" services like bank branches. They just want the branches they use to reflect their own needs and values, just like their parents did. One recent study points out just how closely younger bank customers mirror the consumer patterns of their parents when making service decisions. In it, 49% of respondents see their parents as their primary influencers in shaping their banking and financial views. Another 40% of respondents say they turn to parents and family as a source for financial information. There are differences though. Younger banking consumers want bank branches near their homes or work, especially in urban areas. Also, when this group says "near their homes," they mean the closer the better. Younger consumers drive less than their parents and often prefer to walk, bike, or take public transportation to their bank. Convenient drive-up windows don't matter as much as they did to their parents. Also, new age bank branch structures won't need as much room for paperwork, given technological strides. So, instead of counters and desks to fill out paper deposit and withdrawal forms, the new age bank branch should have self-help kiosks where consumers can tap away and cut time-consuming, pen-in-hand tasks from their trip to the bank. Meanwhile, banks can cross sell at those kiosks while transactions process, giving banks another way to offer services to customers. Nimble and more efficient bank branches will be better positioned to reach millennials where they work, shop and socialize. Community banks need to think carefully not only about the location of new-age branches but also what younger consumers seek service-wise, once they walk through the door - success with millennials will be based on it. In another Adler reading, we found this quote: "The most important thing in communication is hearing what isn't being said. The art of reading between the lines is a lifelong quest of the wise." As you ponder this, be wise and flexible in your quest for customers who belong to this important demographic, as you carry your bank to success for the next generation. Treasury yields sank 7bps by the close of the day as nonfarm payrolls dropped more than 50% from the prior month, casting doubt on the strength of the economy. Yields are currently unchanged as there are no major economic releases scheduled. 1) Wintrust Financial ($20.1B, IL) will acquire Suburban Bank & Trust Co ($470mm, IL) for about $12.5mm in cash. 2) Bank of Commerce ($193mm, OK) will acquire Anadarko Bank and Trust Co ($84mm, OK) for an undisclosed sum. 3) First Financial Bank ($5.8B, TX) will acquire First Bank ($372mm, TX) for $59mm in stock. 4) Town & Country Bank Midwest ($160mm, IL) will acquire The State Bank of Lima ($32mm, IL) for an undisclosed sum. 1) 1st Bank Yuma (AZ) agreed to buy a branch in Nogales, AZ from First Fidelity Bank for about $700k. The branch has $14mm in deposits and $19mm in loans. 2) Horry County State Bank ($422mm, SC) will sell 3 branches in SC to Sandhills Bank ($102mm, SC) for a 2.5% deposit premium. The branches hold $45.5mm in deposits and $8mm in loans. The OCC updated its guidance for banks on issuing all subordinated debt (even if not included in regulatory capital). The guidance focuses on contractual provisions (to ensure bank flexibility and authority are not limited); representations and warranties; covenants; events of default; contemporaneous loan agreements; extraordinary provisions; and additional requirements for sub debt to be included in tier 2 capital. It also provides sample notes including required disclosures, etc. If you are thinking of issuing subordinated debt (even if you are not an OCC bank), you might want to consider reading through this updated guidance. The head of global asset allocation at French bank Societe Generale said he expects the Fed to raise rates 2x this year, as it "very gradually, very slowly" acts to move interest rates. Atlanta Fed President Lockhart said he expects weakness in Q1 to be "transitory" and that the Fed remains on track to raise interest rates in the Jun to Sep period.